The green Cipher gets a disc brake upgrade. Ever since I’ve had the Cipher I’ve been unimpressed with the front drum brakes. While they worked OK, drum brakes never really give you the confidence they would stop you quickly in an emergency, although I'm sure they would have. 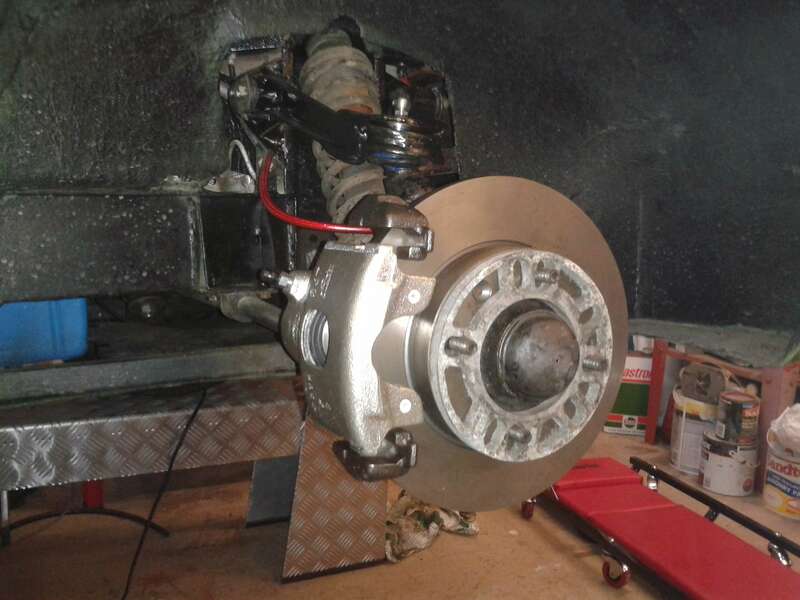 So after a chat with Joe Mason at Reliant Spares, I decided to go for his disc brake conversion kit which he assured me was fine with 13” wheels but hadn’t been tried with the Cipher’s 12” wheels and would probably be a very close fit, if indeed they fitted at all. So I went ahead knowing full well this may cause more problems than it fixed. The kit comprises a pair of discs, calipers, brake pipes, custom spacers and mounting brackets and a couple of 10mm wheel spacers. So let’s cut to the chase. No it doesn’t work with 12” Cipher alloy wheels. So new 13” wheels became an additional requirement. After a bit of research I worked out that MG Midget or Austin Healey Sprite wheels have the right PCD (101.6"), are 13” and the offset is only 3mm different to the Cipher. The Cipher wheel is ET+17 and the Midget wheels are ET+20. I have now fitted 13” x 5" JBW Minilites in silver which I think look OK on the Cipher. The wheels required the supplied 10mm spacers to clear the caliper. This also meant that I had to replace the original wheel studs with 50mm wheel studs to allow for the spacers. When it came to working out what tyres to fit I went for 175/70 tyres which should allow a better range of tyres and still fit and clear all the bodywork and suspension yet keep the rolling diameter similar to the original wheels. 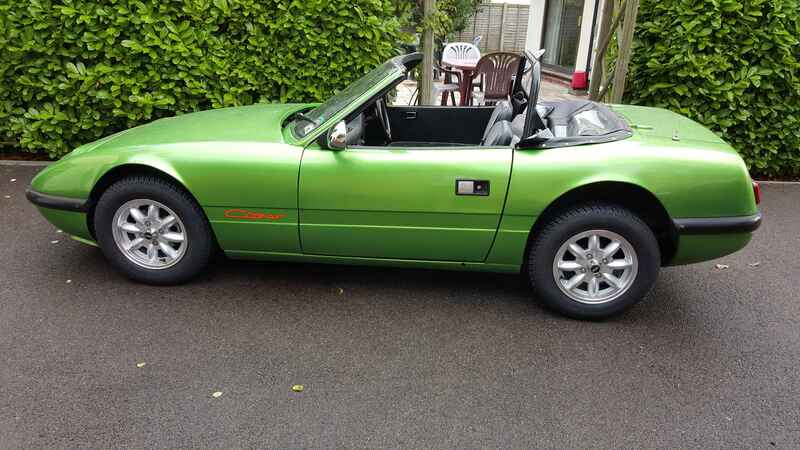 Following a recent track day at Woodbridge the little green Cipher has been subject to a number of upgrades to improve the handling of the car and sort out a couple of irritating faults that developed on the day. At the rear GAZ adjustable dampers have been fitted to improve the rear end handling which proved somewhat lively on the initially wet track at Woodbridge. 13" JBW Minilight wheels have also been fitted using 15mm spacers. So now front and rear wheels match, with the car now running BF Goodrich 175/70 tyres all round. 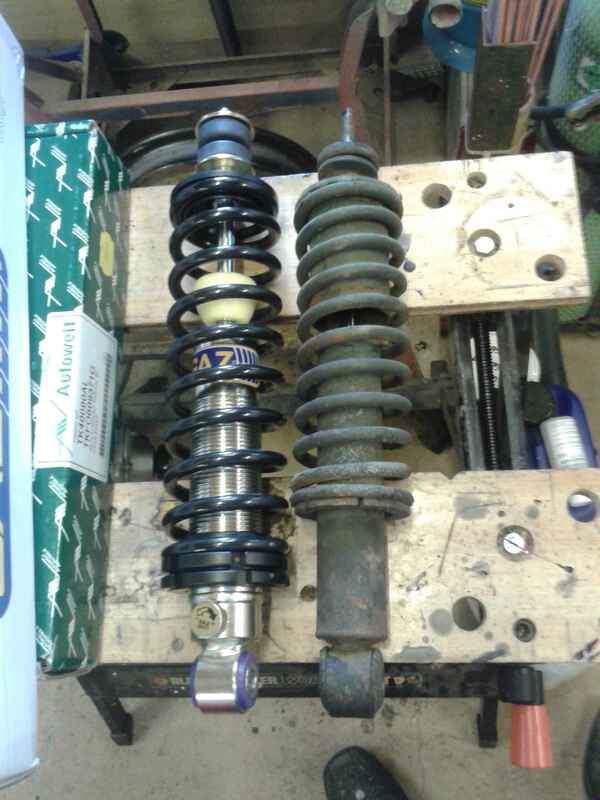 At the front the dampers and springs that looked like the original fitted items have been changed to a pair of GAZ adjustables using 150 pound/inch springs on adjustable spring platforms, courtesy of the excellent Reliant Kitten Register parts scheme. The throttle arrangement was always a bit strange, it appears to be the result of a Reliant 4 wheeler cable matched to a 3 wheeler throttle mechanism. This has now been replaced with the correct Reliant 4 wheeler throttle mechanism, which seems to works a lot more smoothly. Lastly during the track day the Cipher developed a slight water leak. The top hose needed the hose clips tightening up slightly, probably caused by soft engine and gearbox rubber mounts causing the whole assembly to move about too much under track conditions. I've now fitted new engine mounts from a Land Rover gearbox which is a known RKR modification which stops the engine and gearbox moving around so much. Hopefully this will stop the water leak developing again.